“The King” stands proud with the most thoughtful design bringing harmony to all of your senses! Soft contemporary style with the comforts of home in just the right places! This remarkable and fresh condo sits on an upper end corner offering you the picturesque western view of San Jacinto Mountains right outside your front door and balcony! Poolside is always a plus, and The King also brings you this extra feature! Parking is just steps away making this condo one-of-a-kind! 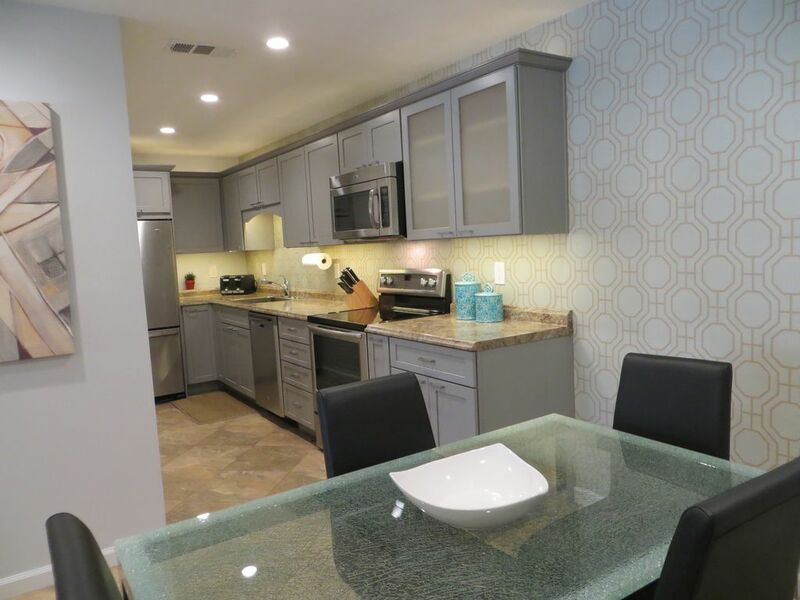 Inside you will be drawn to the “Jeff Lewis” inspired kitchen and geometric wallpaper installed by none other than the same artist that installed paper throughout Frank Sinatra’s home right here in Palm Springs. LED lighting, earthly porcelain tile, and the magical blend of glass, wood and mixed textures brings the outside living indoors. Your kitchen has first-class stainless steel appliances with a dishwasher you won’t even know is on. No extra calories spent here bending up and down as the refrigerator is conveniently located on top! Your mantra in the kitchen will be “They thought of everything!” when you start cooking away! Your spice rack pulls out for quick to reach essentials like Olive Oil and Kosher Salt! The King condo entices you into its King size luxury Tempurpedic-like memory foam mattress...unusual for the Villas. Window treatments add to your pleasurable experience with 7000 series blackout shades in every room! Love the sun? Full exposure available by drawing the shades up past the window opening and drawing back the vertical blinds on the large slider! A 55” Panasonic TV with cable, Wi-Fi and Blu-Ray player will lure you in if you don’t find yourself soaking in the hot tub or trying to win your tennis match on the 4 sets of courts available at the breathtaking Palm Springs Villas I retreat! Wash up from golfing all day with your luxury extra large bath towels and crawl into your soft sheets and rest up for tomorrow so you can ride The Tram or walk downtown at the Village Fest! The King will guide you and make you fall in love with the best kept secret in California - Palm Springs! What a view from the bedroom and balcony! Central A/C with a digital thermostat will keep you comfortable! Central Heat for those (rare) brisk winter nights! Coin-operated laundry room just steps away. 55" HD Plasma in the living room and a 43" HD Plasma in the bedroom. Blu-ray also plays DVDs, Music CDs, and picture CDs! 4 tennis courts on the premises! Lots of golf in the Coachella Valley! Nice place , quite and clean. In all really well appointed and stocked. Only a couple of things that were not a good representation of the whole. Overly worn couch and uncomfortable chair, basically no comfortable seating in living room. Bed was very comfortable and pillows too! Was surprised that washer/dryer was in basement room -shared @ $1.25 each. So bring quarters! Didn't spoil anything. Pool and hot tub were a great addition to our stay. All in all Charming, quite, friendly and great view to tram mountain and sunsets.We really enjoyed our visit and hope to return again. Quiet comfortable place located close to downtown! We had everything we needed. Enjoyed the pool/hot tub and the beautiful surroundings! The people we met were very friendly! Would definitely go back! The outside of the property was not in good repair, especially the stairs. The inside was nicer, but the couch had a big hole in it and did not offer good support. Also, the toilet clogged up and we had to plunge it several times. It seems obvious to me that there were some pre-existing problems with the plumbing. The bed was comfortable and the décor was nice. The views were great. Fantastic condo in quiet and safe location. Would stay again. This is the best place to be in Palm Springs! Located immediately across from the famous Mt. San Jacinto and the Aerial Tram, this condo boasts unobstructed views of the mountains! Right off of North Palm Canyon Drive (HWY 111-the main strip) and the corner of West San Rafael Drive. Just 1.5 miles from the beginning of downtown Palm Springs with shopping, restaurants and convenient to the I-10 freeway. All major stores within 5 miles away. Golf: 100+ Golf Courses in Palm Springs included award winning locations! Check out Indian Canyons, Mission Hills and Indian Wells Golf Resort too! Ski: Bear Mountain is 80 miles away.